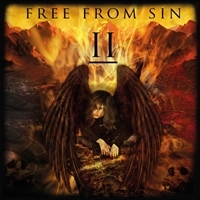 It took a few days since this album reached my hands until the moment I could actually put my ears on it, awaiting the release of the band FREE FROM SIN, II, released on July 20, 2018 by Pride & Joy Music. I confess I was curious to hear what Patrik and Per would bring us, after all it's been three years since the debut album of 2015, and behind a long history between these musicians it is clear that my curiosity would be maintained after the album of the same name. This moment finally arrived, and as a continuation from where they stopped in 2015 "II" displays with a cover art really simple but with a coherent connection with the previous album, where the angel gains the prominence. But let's leave the details aside and finally talk about the album opening in its 1:05 minute intro with "Pandemonium", and this seems to be a fairly common behavior these days, the introductions have gained place in the albums again, the only difference is what will come next. Sure enough, these guys were not meant to disappoint, "Faces Of Christ" jumped to my speakers in a huge way, a shrewd mix of Metal, Progressive and Classical music, and how glorious that becomes together. Per Englund's voice is still as electrifying as it was in Blacksmith's time, and in the same way Patrik Lämborg seems only to grow in his musicality, his riffs and solos are sparkling and magnetic, and the net ingeniously woven around the two by the other musicians makes this work an album, an intoxicating musical megalomania. You might notice it in tracks like "Mr. Blakk" and "God Made You Hate" that sound really powerful and variant, going from nuances of Power Metal to Symphonic. A generous sequel to the vortex in "The Devil's Mule" becomes heavily melodious at various points. "Break And Burn" in turn takes on a more energetic and pulsating rhythm, and I simply love the work of the keyboards of Fredrik Strömberg, time running with more sumptuousness between more classic plans and at other times a more dense background, as in "The Unholy”. "Crossing The Borderline" is also a more vigorous track keeping a line on the edge of the Hard / Heavy differentiation chasm and before leaping to my favorite track on this album, we are talking about "Deceiver", which in addition to possessing a contagious vibration and pulsing honorably on my speakers she still brings a masterful work between Paul Ekdahl's drums and Ulf Kronsell's bass. "Gabriel" in turn is a little more melancholy but has a profuse solo with an ambiguous instrumentation, almost theatrical, creating together a good context to talk about Gabriel. We close the album with "World Victim" and a lot of organ and breathtaking solos, and I can say that this team got it again. Of course nothing is absolutely innovative but if you want a really good album and full of energy I really I recommend "II" for your listening pleasure.